Christopher De León is entering his sixteenth year of teaching and six as a Director at The Leadership Conservatory for the Arts at Tarpon Springs High School. His responsibilities in the Leadership Conservatory include directing and instructing the Marching Band, Jazz Ensemble, Jazz Combos, Wind Ensemble II, Solo and Ensemble Coach, and teaching the Freshman Leadership courses. Originally from Miami, Florida, Mr. De León received his Bachelor in Music Education, with a minor in Jazz Studies, from The Ohio State University. He is a member of the National Associate for Music Educators, the Florida Bandmasters Association, and the Jazz Education Network. While at Ohio State University, Mr. De León was a member of the Jazz Ensemble, Elite Jazz Combo, and founder/leader of the Jazz Saxophone Quartet performing and providing clinics at the local public schools. During the summer of 2007, he toured Europe as a member of the Jazz Ensemble performing in the prestigious Vienna Jazz Festival and the Umbria Jazz Festival. He was also involved as a performer in Drum Corps. 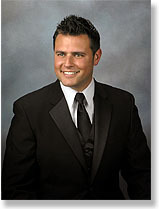 From 2000-2003 he was a member of the Boston Crusaders Drum and Bugle Corps serving as Drum Major in 2003. For over 12 years Mr. De León has been an instructor, clinician, and drill designer with bands and winter guards throughout the country. His groups have been consistently recognized for their excellence at Bands of America and World Guard International on both the Regional and National levels. He has also served as an All-County Honors Jazz Band clinician for several counties throughout Florida. Mr. De León spent four seasons (2004-2007) as an instructor and assistant Visual Caption Head with the Boston Crusaders Drum and Bugle Corps before serving as the Visual Caption Head for the Blue Stars Drum and Bugle Corps for the 2009 and 2010 competitive seasons. He has served as a Jazz Clinician for several counties in Florida. As a Music Educator, Mr. De León has been awarded the National Band Association’s Certificate of Merit in 2012 and the Citation of Excellence in 2016. Mr. De León is married to his wife Traci and is a proud Father to his daughter Alyssa Maria.